Microsoft CEO Steve Ballmer is pumped, the conference room is packed full of reporters, tech enthusiasts, and yes… even critics. But nonetheless, BGR (BoyGenius) is on location and providing us all with live blogging so that we don’t miss a beat. What can we expect from the Windows Phone 7 conference? For starters, the conference is being sponsored by AT&T. 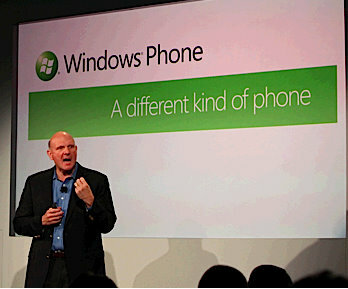 So definitely we can expect some new mobile phone news – phones powered by Windows Phone 7 OS. But there is also rumors about Microsoft (Steve Ballmer) slipping in a surprise announcement such as a Windows Phone 7 tablet pc “Slate PC”. So who knows exactly, but follow BGR to get the latest and greatest as it happens.